We are very excited to announce that we are participating in the Fall Festival Giveaway Blog Hop with 110 other blogs. 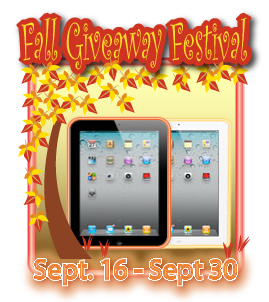 Each blog will have their own giveaway you can enter and there will be a grand prize of an iPad 2! Woohoo! Please mark your calendars! The blog hop starts September 16 and ends on September 30. We would like to give a BIG thank you to the Fall Giveaway Festival Hop Sponsor @RetailMeNot for the grand prize- an Ipad2.